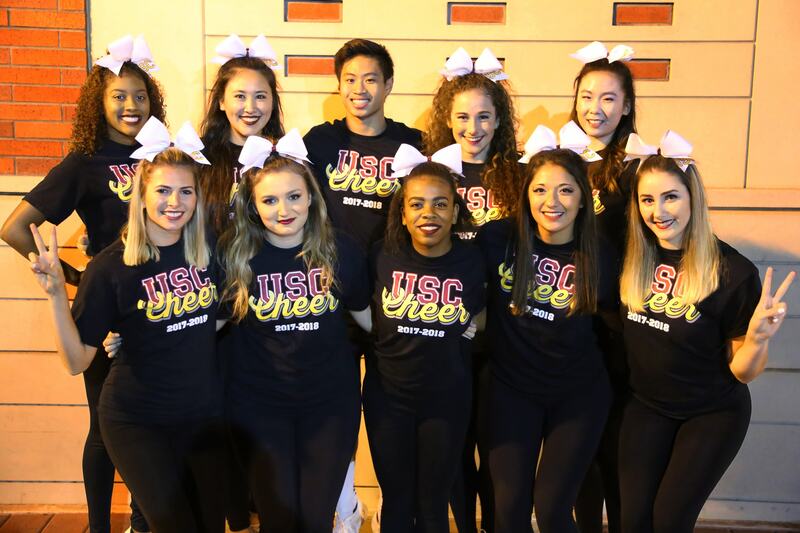 The USC Competition Cheer team is working to raise money in order to compete at the most prominent collegiate cheer competition in Daytona Beach Florida! We are the University's only competition cheer team and have been competing since 2003. We attended competitions all throughout the US, from our home city of LA to Daytona Beach Florida. We are a team of 12 hard working individuals who continuously work to better ourselves and each other through the cheerleading world. We practice three times a week and are always working on stunting, tumbling, jumps and so much more. We partake in a sport that tests all areas of our body, from our physical body to our minds. The competition that we are raising funds for is the biggest collegiate competition in the US. It is held in Daytona Beach Florida and is called the NCA. This competition is one that the team has been attending for the past three years. Each year that the team has gone they have placed higher in their rankings, with this past year getting 5th place out of 12 teams. This competition is what all college cheerleaders look forward to attending. You get to compete head to head with some of the best teams in the world and meet some of the most notable people in this industry. Through this campaign, we are raising funds to pay for competition fees, car rentals, airplane tickets, apparel, and hotels. All the money we raise will towards our athletes and help to make sure this experience is one they won't forget. This year we have been working harder than we ever have and hope to place even higher at Nationals. We practice longer and more frequent and are always in the gym bettering ourselves. Each athlete has the passion in their hearts and the drive in their eyes that shows how much they want to do well in this competition. This year feels like it is going to be the best year for the competitive cheer team and is going to leave each athlete's name down in history. With this donation, you have bought a t-shirt for one of our athletes to wear at Nationals! The shirts help promote our University and our club! Thank you for helping to pay for travel expenses such as car rentals and airplane tickets. You are helping us attend Nationals! Thank you for helping to pay for our competition registration! This amount helps allow each of our athletes to compete at the most significant​ collegiate competition in the US!